What if You Could Break the Chains of Food Addiction for Good? Teresa Shields Parker talks honestly and transparently about her journey into and out of sugar addiction. In the process she lost 250 pounds and tons of emotional baggages. More than that she learned what it's like to walk closer to the Master than ever before. She is in the process of being healed — body, soul and spirit. You will be encouraged and amazed. You'll laugh and you'll cry. But most of all you will see yourself in this book. Maybe your addiction isn't sugar or gluten or food of any kind. Maybe it's something totally different. Teresa's desire is that you learn from her mistakes and walk into the reality of what living in the freedom of Christ is all about. Oh, and along the way, she hopes you, too, lose the weight that so easily entangles you and that emotional stuff that just won't seem to let go, as well so that you walk into health, wholeness and happiness. NOW available INSTANTLY in downloadable ebook format! 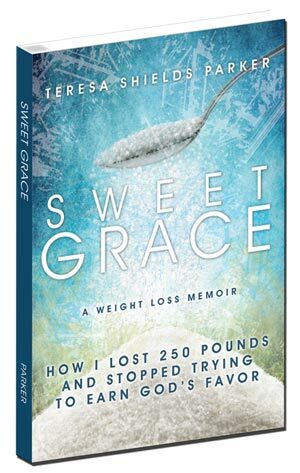 Go to Amazon for ﻿﻿﻿Print﻿﻿﻿, ﻿﻿﻿Kindle﻿﻿﻿ or ﻿﻿﻿Audible﻿﻿﻿ versions of Sweet Grace! It IS possible to overcome food cravings and ﻿﻿﻿live free & healthy﻿﻿﻿!